It’s that time of year again! If you’ve been around awhile, you now expect (and love) it. If you’re new to BHP, get excited. Each year, we take a hard look at existing BHP course content and support materials. We review feedback from teachers and scholars that we’ve collected all year, and then carve out a good chunk of time for implementing suggestions. All in the name of keeping Big History the best course in history. 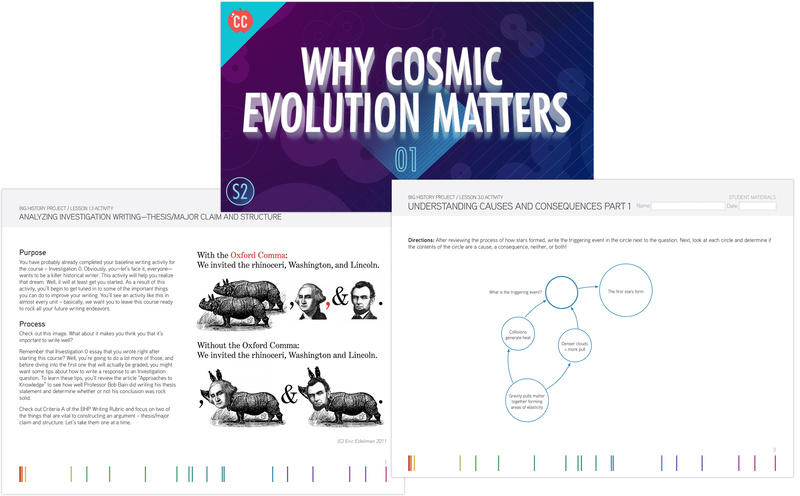 New materials include Crash Course videos, Investigation writing, and Causality activities. The changes are enough to keep the course exciting and relevant, but we draw the line at doing anything that would throw veteran BHP teachers for too big a loop. Fear not: any content that appears to have been removed from the course can usually be found in “Other Materials” at the bottom of each unit. So without further ado, here’s what’s new for the 2017/18 school year! Take a look and let us know what you think in the BHP Online Teacher Community. 3. Causality: A new essential theme! • Writing is hard. Teaching writing is even harder. We need our instructions to do more and align across activities. We also need to mention BHP Score in the lessons themselves. • Teachers need a writing baseline earlier in the course (enter Investigation 0). We tackled both issues. The Investigation instructions are still long, but consistent. Students get a better idea of which writing skill they’re working on with each activity. Teachers get better info on how and when to submit for free scoring. Heads up! We’ve added an “Investigation 0” to the end of the first lesson. It is intended to be administered the first week of school so that you get baseline data on your students’ writing. It is the same essay as “Investigation 2,” and that’s intentional. By having two data points on the same essay (one from the first week of school, and one from a few weeks later), students will be able to see where they’ve grown and where they need to improve. Hopefully, they’ll begin to see writing as a journey of continual improvement. Investigations 6 and 9 are also eligible for evaluation by BHP Score, so students can look forward to clear and consistent feedback on their progress throughout the year. Are we in the beginning, middle or end of the story of the Universe? Whoa. Check out Why Cosmic Evolution Matters. Are humans causing the next mass extinction? Also – we often learn about the extinction of the dinosaurs, but why should we also care about an earlier mass extinction of bacteria? Dig in to Why the Evolutionary Epic Matters. *These will air on YouTube, and will be added to the BHP course later this summer. The Big History Project course is all about change. And about helping students learn to describe, analyze, and connect changes that take place over vast expanses of time and space. After just a few lessons, students become adept at using the thresholds of increasing complexity to make sense of the history of the Universe, where we are today, and where we’re going. But we want students to be able to do more than describe change over time—we want them to be able to evaluate and make claims about the causes and consequences of change in history, science, and the world around them. That’s where causality comes in. Cause and consequence is critical to the work of historians, scientists—any expert working to better understand the world around us. The analysis is as complex and dynamic as history itself. However, research shows that students typically view change over time as links in a linear chain – that is, the most important cause or consequence is the one closest in time and space. To help students develop their ability to understand cause and consequence—an important critical-thinking skill—we’ve added four new activities . These activities introduce vocabulary, categories, and techniques that experts use to analyze causality. Students will learn how to identify different types of causes and consequences and map the relationships among them. Note: Unit outcomes have been updated to reflect causality. For example, the outcomes for Unit 3 now include: Identify various types of causes and consequences, including short-term, long-term, and triggering events. We hope you find this addition to your students’ critical thinking tool chest helpful. For more on causality and how you might approach it instructionally, be sure to complete Session 5.1: Causality of our online PD course, Teaching Big History. Who doesn’t love an excuse to hear from Bob Bain? !